When the first rays of the sun rose, I was in my kitchen, surveying its partially unpacked state. In the last week and a half, I’ve cooked dinner here exactly twice — it’s been too hectic, too busy, too hard to do it more. Last night was the second time, tonight I hope to be the third. Moving this time was hard, even though it was only from one side of the city to the other. Maybe it really was how much was happening at once. 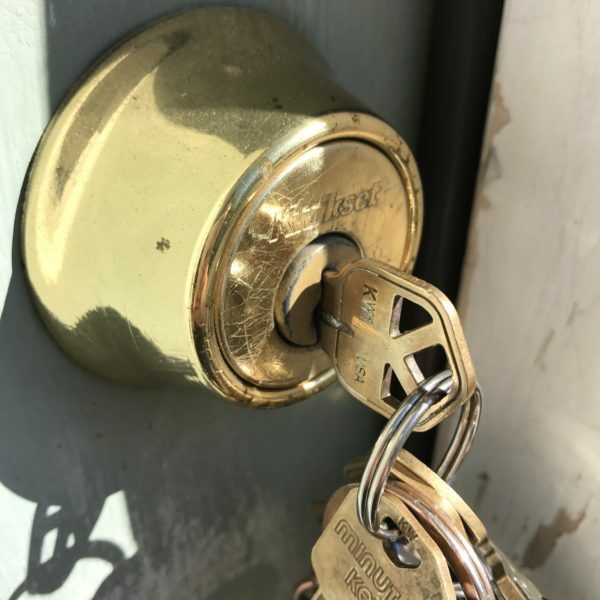 Maybe it was something else — the emotional side of a big move like this, for instance. Whatever it was, we’re finally all moved in and settling in. 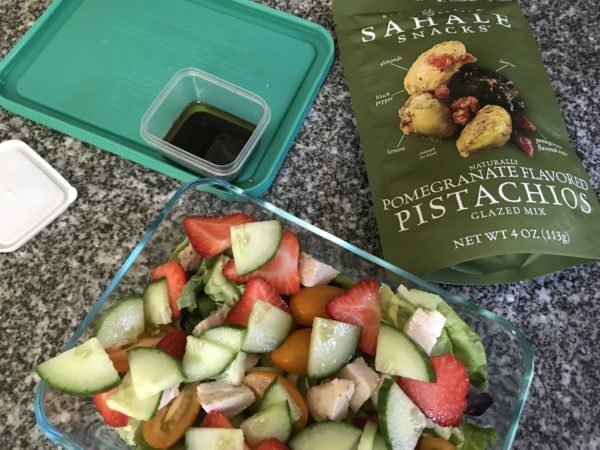 And after too much speedy dinner options, I am so ready for quick, easy, healthy homemade foods … like this Chicken Strawberry Salad with Pomegranate Pistachios recipe. It’s made with Sahale Naturally Pomegranate Flavored Pistachios. If you haven’t had these nuts, I recommend them enough. I have loved them for years and years as snacks, on salads, on rice bowls and so much more. From the first time I tried Sahale Snacks, I was sold. 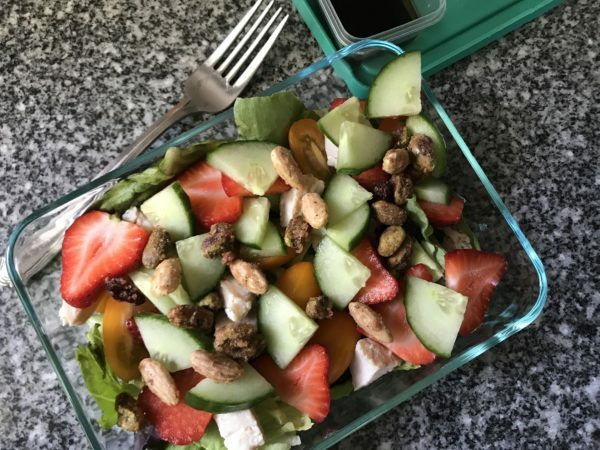 And on this salad, they add a pleasant crunch and sweetness to the mixture of butter lettuce, chopped rotisserie or roasted chicken, strawberries, tomatoes and cucumbers — all things still in season here in Maine. Dressed with balsamic, olive oil and a sprinkle of salt and pepper, it’s a pleasant lunch for enjoying anytime. 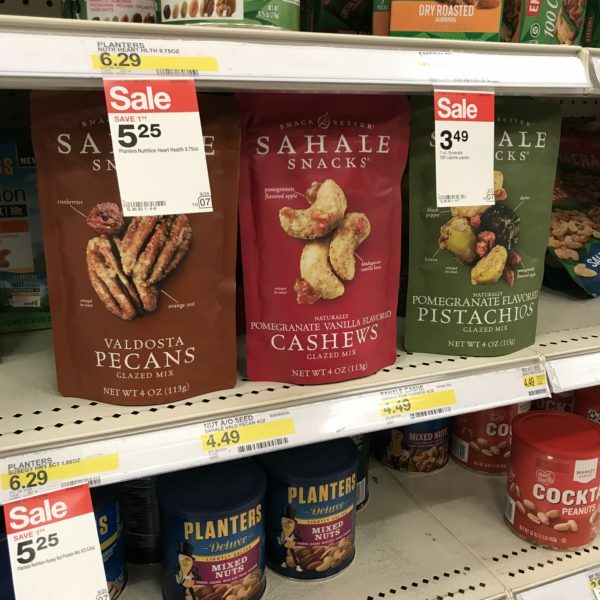 Sahale Snacks come in four fantastic flavors — Valdosta Pecans Glazed Mix, Naturally Pomegranate Vanilla Flavored Cashews Glazed Mix, Honey Almonds Glazed Mix and Naturally Pomegranate Flavored Pistachios Glazed Mix. They are Gluten-Free Certified, Non-GMO Project Verified and Kosher. But really, every bite is what makes them special — meaty, sweet, well-flavored and lovely. I get mine at Target in the nuts aisle. There’s also a special offer on Cartwheel … so check that out before you head to Target! Layer the lettuce, tomatoes, strawberries, cucumber and chicken in a bowl. Drizzle with olive oil and vinegar. Season with salt and pepper. Enjoy. Previous Post: « Is This What Too Busy Feels Like? Nice fresh option to enjoy anytime of the day. Thanks for yoru participation on this shop ~ client. These sound so good. Got to try them! I haven’t moved in a long time, but my mom is in the middle of a very big one right now, and I can see how much it can turn everything upside down. Good luck getting settled! 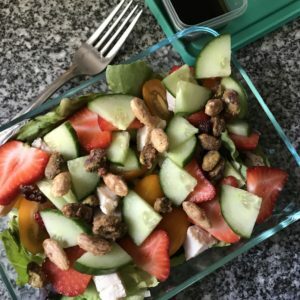 Love this salad, has so many yummy and healthy ingredients!